Where should we go to eat when none of us can agree on a cuisine? OMG, this is my life! I feel your pain! Either go to Whole Foods* or Todd English Food Hall in the basement of the Plaza Hotel. Look at this TEFH menu and tell me that each of you cannot find something. C’mon. I’m not going to tell you that either of them is spectacular or the best food you’ve ever eaten or anything like that, but if you’ve all got conflicting priorities, these two places could do it for you. Museum of Math opened in December – should I go? 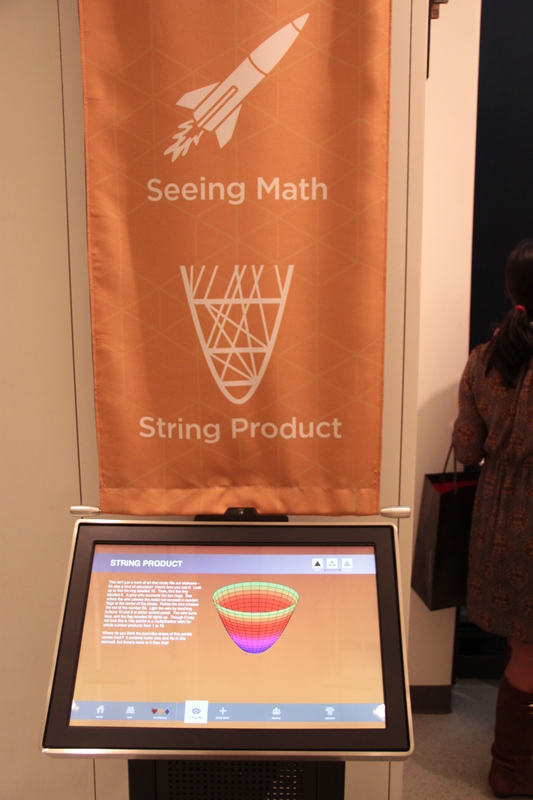 Here’s the short version – if you are a tourist who is in town now, loves math, and is excited about this museum, get yourself to The Museum of Mathematics. If you are a local, want to be busy for an hour or two, and love math particularly, I’d give it a few more weeks to get settled, and then go on a weekday (if possible). If you’re looking for something science-y and not specifically only math-oriented and want to spend a day, visit the New York Hall of Science in Queens instead. I went to the Museum of Mathematics on Sunday, January 6, 2013 and was generally impressed. It’s a loving tribute to mathematics, made by people who managed to raise heaping loads of cash. They scored big on aesthetics and some of the exhibit detail was wonderful. Many of the exhibits seem to be geared toward children in the 4th through 8th grade range. Excellent exhibit detail was presented in basic, intermediate and in-depth levels. 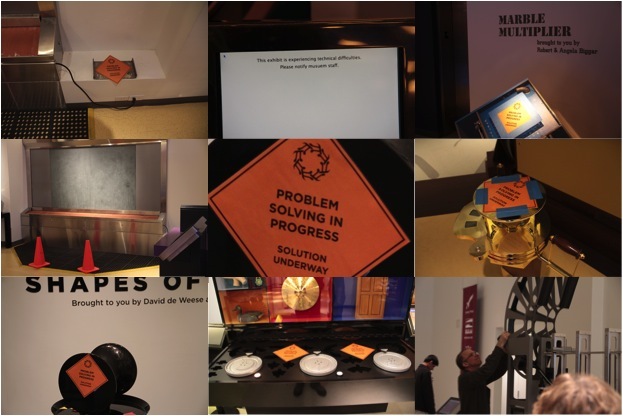 There were many hands-on exhibits, and the Enigma Cafe (a place to sit and work out puzzles on the lower level – there is no food served) seemed especially interesting. However, even though the museum was probably at half capacity (or less) when I went, this puzzle area as well as many of the exhibits felt crowded. This is why I advise going on a weekday if you can. 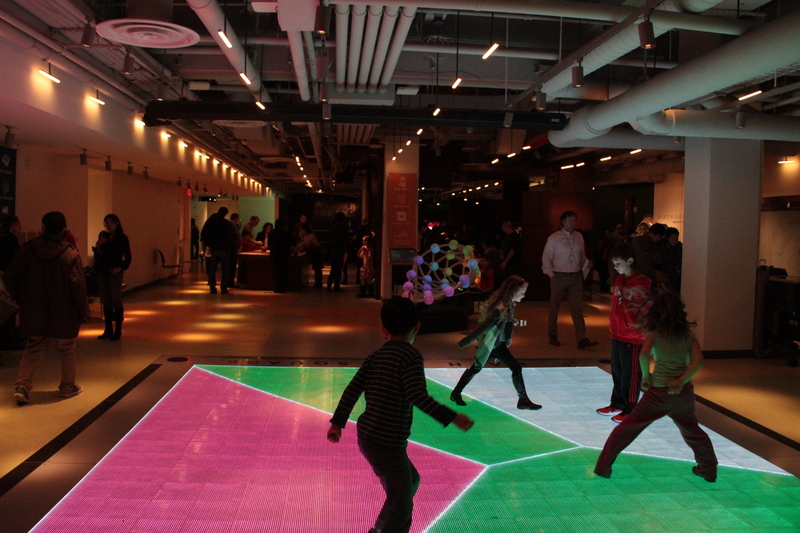 Screaming children, lighted floor, well-thought out seating. 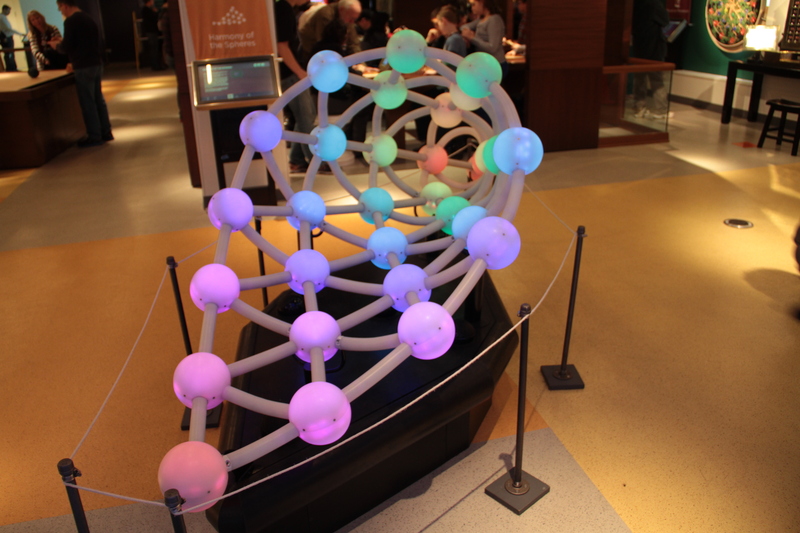 Harmony of the Spheres is a hands-on exhibit that makes music. The reason I have suggested waiting a few weeks if you are local is because many of the exhibits were out of order when I was there. The Museum of Mathematics just opened in December, so they’ll probably get it all up and running soon (I hope). Many exhibits were unavailable or being repaired during our visit. Give yourself between 1.5 and 3 hours to visit the museum.